A fast-growing Chicago company that provides primary care for the elderly has inked what could be a lucrative deal to join Aetna's Medicare Advantage network. Oak Street Health will essentially be paid a fixed amount of money for each Aetna member it treats. The privately held provider can keep money it saves by managing patients' medical care well, but would take a financial hit if patient care ends up costing more than projected. These types of risky financial arrangements between doctors and insurers have accelerated as federal regulations call for carriers and providers alike to deliver better care while spending less. For Aetna, a national insurer based in Hartford, Conn., administering Medicare health insurance benefits through private Medicare Advantage plans is becoming a major driver of revenue. Developing relationships with doctors to treat elderly patients, who are often expensive with multiple ailments—think diabetes, high blood pressure or heart disease—is key to managing medical care and costs. Dr. Griffin Myers, chief medical officer and co-founder of Oak Street, said the clinic network is up to the task. For one, Oak Street has a lower rate of patients who are readmitted to the hospital too quickly after being discharged, compared to rates in metro Chicago and nationwide. Here's another: Oak Street provides eye exams at clinics. That's not a service available in a typical doctor's office. "In a lot of the communities we serve, there's not great access to ophthalmologic care," explained Myers, who declined to say how much revenue Oak Street generates. "But over 40 percent our patients have a diagnosis of diabetes. Rather than hoping that our patients find their way to that, we've invested in the technology to be able to do those exams in a primary care clinic. It makes us a better plan partner." Here's another advantage: Oak Street has private equity dollars in addition to Medicare revenue. Its competitors, such as non-profit clinics, rely heavily on government money and often don't have the financial resources to make heavy investments in staff and facilities. 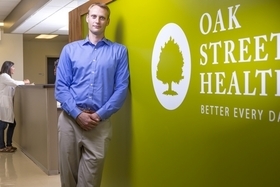 Oak Street launched its first clinic in 2013 on Chicago's North Side. The business has since swelled to treat more than 30,000 people at nearly 20 sites in Illinois, Indiana and Michigan. About half of Oak Street's patients are on Medicaid, too, the government-run health insurance program for the poor and disabled. The network has clinics in impoverished neighborhoods to serve patients close to where they live. The Oak Street model works like this: surround patients with a doctor, a nurse, and a care manager, among other providers. Clinics also offer classes for patients on everything from using the Internet to learning Spanish. A partner with clinics embedded in low-income areas that offers services beyond health care was attractive to Aetna, said Kristin Myers, president of the insurer's Great Lakes market, which operates in Illinois and four other states. So was Oak Street's investment in technology to not just respond to a patient's needs, but to predict them. "Where do the conversations (between patients and providers) really happen and where can we best meet members where they are," Myers said. "It's going into these communities and thinking about these clinics." About 26,000 Aetna enrollees in the Chicago area are now eligible to choose an Oak Street doctor. For now, the deal involves only Oak Street's Illinois clinics. This​ story,​ first​ titled,​ "Fast-growing​ Oak​ Street​ Health​ forges​ deal​ with​ Aetna,"​ originally​ ran​ in​ Crain's​ Chicago​ Business.